Next Monday, our Lexis Korea will be closed because of public holiday (National Liberation Day). We notify and post this news on our blog to prevent coming to school on Monday for our students and New Students !! On the 15th Of August is really special public holiday in Korea and our histories. We called this day as “National Liberation Day” to honor our historical heroes’ ideals of saving our country. This holiday is really meaningful and unforgettable day for Korean. By the way, Let’s have fun till next Monday and don’t forget your homework! 😛 And also, we look forward to meeting our new students next Tuesday at our Lexis Korea !! 12 new students commence their studying and also there are 1 previous student return at Lexis Korea from this week. Leslie from Mexico, Keisha,Nicholas,Ethan and Walt from USA, Jacin from Singapore, Nasanjargal from Mongolia, Amy from Netherlands, Marie-Anne from Switzerland, Eun-Ji from Vietnam, Angelina from Germany And Olga from Sweden !! 이번주 렉시스코리아에는 12명의 신입생이 한국어 공부를 시작했어요. 멕시코에서 온 레슬리, 미국에서 온 키샤,닉,이든 그리고 월트, 싱가포르에서온 제이신, 몽골에서 온 나사아, 네덜란드에서 온 에이미, 스위스에서 온 마리안, 베트남에서 온 은지, 독일에서 온 안젱이나 그리고 스웨덴에서 온 올가!! 이번 주, 렉시스 12명의 신입학생들은 각자 다른 9개국에서 온 한국에 관심이 많은 학생이에요. 날씨가 점점 추워지고 있네요. 요즘 같이 추운 날 밖에서 놀기에는 너무 추워요.그래서 실내에서 쇼핑도하고 맛있는 것도 먹을 수 있는 멋진 공간을 소개 해드릴게요. 렉시스코리아에서 그리 멀지 않은 이 장소는 고속버스터미널역과 연결된 장소에요. 바로 파미스테이션이라는 곳이에요. 이 곳에는 굉장히 다양한 가게들과 맛집도 많이 있어서 쇼핑과 식사를 동시에 할 수 있는 쇼핑센터에요. 파미스테이션에는 한식뷔페인 올반(hansik olbban), 다양한 종류의 팝콘을 파는 쿠쿠루자(KuKuRuZa), 함박스테이크 집인 구슬함박(Gooseul Hambak), 매콤한 카레 돈까스집 아비꼬. (Abiko), 스웨디시 디저트 카페 피카(FIKA) 등등 어마무시하게 다양한 가게가 많이 있어요. 그 중에서도 지나는 파미스테이션에 위치한 콩부인(Congbuin) 레스토랑을 가장 좋아해요.콩부인에서 밥을 먹고나면 왠지 건강해지는 기분이에요. 오가닉 재료를 사용한 음식들이 많이 있어요. 그 중에서도 콩부인의 시그니쳐 메뉴인 모찌 샐러드는 정말 말이 필요 없어요. 왜 시그니쳐 메뉴인지 먹는 순간 알게 될 거에요. 그 외에도 파스타와 스테이크와 같은 메인 디쉬가 다양하게 있어요. 금액은 조금 비싸긴 하지만, 돈이 아깝지 않아요. 자… 이제 밥도 맛있게 먹었으니 그 다음에는 무얼 할까요? 바로 쇼핑이죠 ~!! 우리 렉시스 코리아 학생들이라면 카카오톡 다 알거에요. 이 곳 파미스테이션에는 카카오톡 캐릭터 프렌즈 샵이 있어요. 이 곳에는 카카오톡 캐릭터 관련 제품들이 많이 있어서 충동구매를 일으키니 조심하도록 해요!! 그 외에도 다양한 제품들을 파는 샵들이 많이 있으니, 요즘 같이 추울 때 ~ 밥과 쇼핑을 한번에 하고 싶을 때 ~ 파미스테이션에서 즐거운 시간 보내는 건 어때요? The weather is getting cold but too cold to spend time outside. I found hot spot to go shopping with nice restaurants where close to Lexis Korea. You know express bus terminal station on orange line(No.3) and khaki line(No.7) ~ this place is connect to this station. This place name is “Famille Station”. There are various shops and fabulous mint restaurants such as Korean buffet “Hansik Olbban”, Popcorn shop “KuKuRuZa”, Japanese style steak shop “Gooseul Hambak”, Spicy Donkazu shop “Abiko”, Swedish style dessert café “FIKA” and etc. The best of restaurant for me? That is “Congbuin”. When I had meal at this restaurant, I felt be healthy cause the materials of food that’s are some organic menu. Mochi Salad is the signature menu of this restaurant. When you have this salad after one bite you will know why this menu is the best in this restaurant. And also there are main dishes as pasta and steak. The price is little bit high but it’s not wasting the money to have meal at Congbuin. What you gonna do after having meal? It should be Shopping time !! If you are our Lexis Korea friends, you must know Kakao talk!! I love Kakao talk characters!! There are friends shop of Kakao talk and of course there are lots of products that related to kakao talk charectrs. You can see lots of good shops to go shopping at Famille Stations. 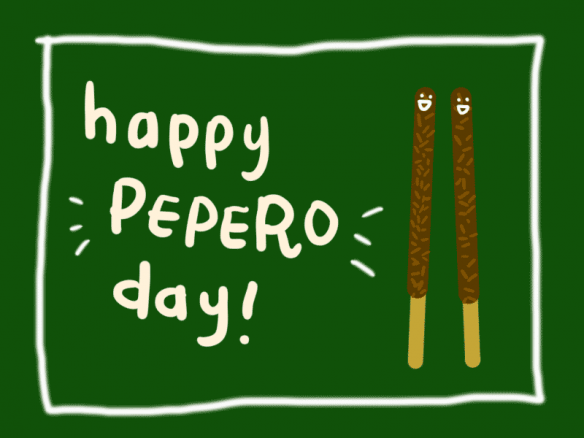 Pepero Day is an observance in South Korea similar to Valentine’s Day, but held on November 11. The purpose is to exchange peperos to show affection for friends and loved-ones.